Metanoodle: "The Great Election In Missinaba County"
"The Great Election In Missinaba County"
"Everybody in Mariposa is either a Liberal or a Conservative or else is both. Some of the people are or have been Liberals or Conservatives all their lives and are called dyed-in-the-wool Grits or old-time Tories and things of that sort. These people get from long training such a swift penetrating insight into national issues that they can decide the most complicated question in four seconds: in fact, just as soon as they grab the city papers out of the morning mail, they know the whole solution of any problem you can put to them. There are other people whose aim it is to be broad-minded and judicious and who vote Liberal or Conservative according to their judgment of the questions of the day. If their judgment of these questions tells them that there is something in it for them in voting Liberal, then they do so. But if not, they refuse to be the slaves of a party or the henchmen of any political leader. We can see,—it's plain enough now,—that in the great election Canada saved the British Empire, and that Missinaba saved Canada and that the vote of the Third Concession of Tecumseh Township saved Missinaba County, and that those of us who carried the third concession,—well, there's no need to push it further. We prefer to be modest about it. Missinaba County, I say, is a regular hive of politics, and not the miserable, crooked, money-ridden politics of the cities, but the straight, real old-fashioned thing that is an honour to the country side. Any man who would offer to take a bribe or sell his convictions for money, would be an object of scorn. I don't say they wouldn't take money,—they would, of course, why not?—but if they did they would take it in a straight fearless way and say nothing about it. They might,—it's only human,—accept a job or a contract from the government, but if they did, rest assured it would be in a broad national spirit and not for the sake of the work itself. "Mr. Smith," said the reporter of the Mariposa Newspacket, "we'd like to get your views of the effect of the proposed reduction of the differential duties." "By gosh, Pete," said Mr. Smith, "you can search me. Have a cigar." "What do you think, Mr. Smith, would be the result of lowering the ad valorem British preference and admitting American goods at a reciprocal rate?" "It's a corker, ain't it?" answered Mr. Smith. "What'll you take, lager or domestic?" And in that short dialogue Mr. Smith showed that he had instantaneously grasped the whole method of dealing with the press. 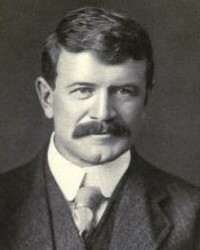 The interview in the paper next day said that Mr. Smith, while unwilling to state positively that the principle of tariff discrimination was at variance with sound fiscal science, was firmly of opinion that any reciprocal interchange of tariff preferences with the United States must inevitably lead to a serious per capita reduction of the national industry." And so on, chapters 10 and 11 of Sunshine Sketches of a Small Town, available on line.